It seems fitting that Brian T. Jaynes would opt to debut the trailer for his upcoming “Boggy Creek” movie just a little over a week after the passing of legendary cult film maker Charles B. Pierce. As most of you know, Pierce made the original “Legend of Boggy Creek” film with $160,000 he borrowed from a friend. That film would go on to become a drive-in hit and fan favorite. Though many sources are listing Jaynes film as a remake of Pierce’s original, in actuality, it really isn’t. The differences between the two films are just too numerous to ignore. For starters, though both films feature a swamp stalking Bigfoot, the original film was about the infamous “Fouke Monster” who terrorised the small town of Fouke, Arkansas, in the early 1970s. The location for the events of Jaynes new film, take place in the fictional town of Boggy Creek, Texas, which actually lends it’s name to the movies title. 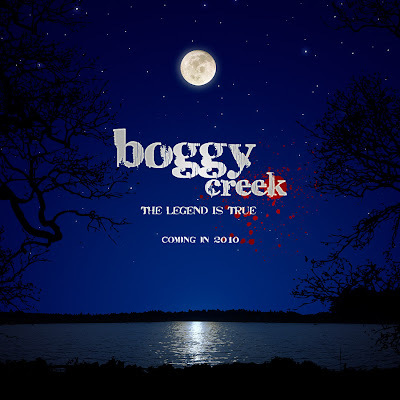 “The Legend of Boggy Creek” and “Boggy Creek”, not the same thing. Now, before someone corrects me, there is a section of a rather pretty rural area north of Austin, called “Boggy Creek”, but no one would confuse the swamps seen in the “Boggy Creek” movie with this lush farm belt. Now that we have gotten that out of the way, Jaynes new movie looks like a really good Bigfoot related horror movie. Okay, I do want to point out that it is obvious that there are some similarities between the new, and old “Boggy Creek” films. So it would be safe to say that this modern version was ‘inspired by’ Pierce’s classic. Though the 1972 film was filmed ‘documentary style’, while the 2010 incarnation is straight-forward horror film. Let’s just wait and see if Jaynes can manage to scare the crap out of us the way that Pierce did. Here is the trailer for “Boggy Creek”. This entry was posted on Friday, April 30th, 2010 at 9:59 am and is filed under Bigfoot, Cinema News, Cryptid Cinema, Folklore, Monster Island News, Movie Monsters, Pop Culture, Sasquatch, Swamp Monsters. You can follow responses via our RSS 2.0 feed. You can skip to the end and leave a response. Pinging is not allowed. A bigfoot slasher movie is what it looks like.